Three years ago, we were almost laughed out of the Game Developer Conference Show floor. C# as the heir to C++ back then was mostly an academic discussion. And there were only a few anecdotal examples of developers using C# for fast and safe scripting in games such as Second Life and Unity. In the past years, a new generation of game developers have entered the stage. These are developers that have cut their teeth with Unity, XNA and frameworks like PyGame. They value malleability, rapid iteration and safe environments without crashing over raw performance. They have grown used to profiling their software and tuning the hot-spots instead of depending on hunches that lead to premature optimizing. This year things were very different at our booth. Lots of happy Unity users came by to talk about MonoDevelop, about the new soft debugger, and about the joy of using C# to build applications with Unity. Lots of people are working on big and small game titles using Mono. MonoTouch and MonoDroid also helped us gain visibility in this space. Lots of existing users, and users-to-be came to discuss Mono's state. 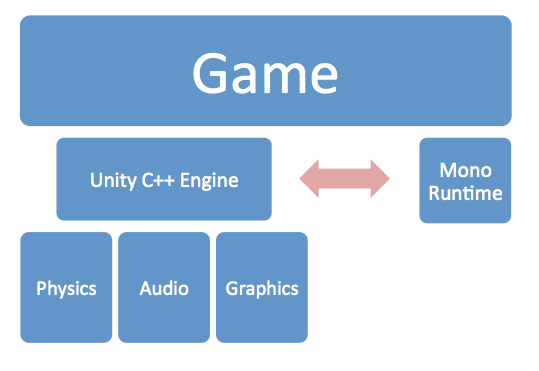 But Mono has now spread its wings from being a pure extension system for C++-based systems (like Unity or the Sims3), to be used as the main language for building game engines and game frameworks. There is the 2D MonoGame (an open source effort previously known as XNAtouch) which supports iPhone, Android (and they are working on Windows and Mac backends). At the show, both DeltaEngine and Silicon Studio were showing pure C#-based 3D game engines powered by Mono. There were as well a number of stealth-mode projects and startups using Mono either as their scripting engine or the main runtime. Walking around the GDC show-floor, you could see Mono running in many booths thanks to Unity's overwhelming popularity. Perhaps my favorite Unity game at the show was Rochard, an upcoming PS3 game with interesting puzzles and the level of polish that you expect from a game like Ratchet and Clank (videos, screenshots). In the past couple of years we have made some changes to Mono that help developers use Mono as either a scripting system for an existing C or C++ code base, or for those using Mono as their main runtime. Mobile profile: a minimal profile of class libraries that is better suited for mobile, embedded and console uses. LLVM-based code optimizer: in addition to our standard code generator designed for JIT compilation, we now offer developers a choice to use the LLVM optimizing compiler to generate code. Modulo a handful of issues, the code generated is as good as the one you would get by doing low-level programming with C++. Unsafe execution: some of our users wanted to continue using Mono and C# for their code for compute intensive operations. We now offer an unsafe option that will remove all arrays bounds check from the code. This, needless to say, is incredibly unsafe as it would open the doors to the sort of bugs that are common in C++. But if you are dying to squeeze the last bit of performance and treat C# as a nicer C++ and are ready to make a commitment to debug memory-corruption bugs, we got you covered. Runtime Continuations: to create lightweight co-routines that are not bound to threads and allow developers to suspend execution at any point without having to change their code, or require new compilers. Silicon Studio's Homei system uses it. Additionally, many developers are doing a little bit of embrace-and-extending the Mono runtime in creative ways to extend the CLI in new ways. We want for example to introduce both a [ForceInline] and a [UnsafeCode] attributes that can be applied to methods to hint the code generation engine to always inline a method, and to remove arrays-bounds-checking on a per-method basis. A hot topic at the GDC was when we would bring the new C# 5 "await" feature to Mono. C#'s await is a perfect solution to many of the problems that game developers face. Although there are solutions like Unity's co-routines, Mono Continuations/microthreads and Michael Hutchinson's open sourced micro-threading framework these features require a particular set of programming practices and pattern or support in the VM to do this. C# Await is beautiful in that it integrates directly into the language and allows developers to focus on the algorithm and not in the administrivia of suspending execution and the boilerplate involved. Which leads me to F#. The C# await functionality is based on F#'s Asynchronous Workflows which is available to everyone (thanks to Microsoft open sourcing the F# compiler and runtime). What is fascinating is what some people are doing with F# in games: they can use F# to express the game AI in more succinct terms than any other scripting language can do. Not being a game designer, I do not quite understand the domain space, but apparently F# is just what the doctor ordered for complicated AI behaviors. This coupled with async execution is a game engine developer's dream. But F# is not for everyone, there is a learning curve for getting to express problems in F# that is not suitable for game developers that have simple needs for their in-game logic. Many tool vendors (animation, pipeline, version control) have used WPF for their software or are planning on using it for new projects. These vendors have historically only supported Windows and are now looking at adding either Mac or Linux. This became almost a FAQ at the Mono booth: when are you going to ship WPF on Mac/Linux. We have no plans on building WPF. We just do not have the man power to build an implementation in any reasonable time-frame. Use Gtk# if you want to share the same code across all three platforms. Split your UI code from the non-UI code and build a UI per system. On Windows, use WPF, on Mac use MonoMac, on Linux Gtk#. Or use gtk# on Mac and Linux. For tools that are mostly OpenGL/DirectX based, use Windows.Forms, keeping in mind that some bug fixing or work around on their part might be needed as our Windows.Forms is not actively developed. Monomac.Winforms: assist the effort to have a Winforms look-alike API that happens to be based entirely on MonoMac and provides a native experience at the expense of dropping compatibility with some Winforms features. Create an SWT-like toolkit, like Eclipse did for Java, but this time for .NET. Mapping UI components to Cocoa, Gtk+ or WPF depending on the platform. Use Silverlight on Windows. And then use a modified version of Moonlight on Linux (and assist porting Moonlight to Mac) to get enough support to integrate with the native OS (menus, file dialogs, file system access) and to access and embed OpenGL in their applications. WPF implementation: not impossible, but this will require someone to fund some 15-20 developers to implement this enormous stack and some 2-3 years of work.